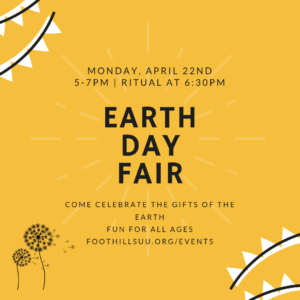 The Family Ministry Team, Climate Justice Ministry and Earth Based Path group are teaming-up for an Earth Day Fair - a time of embodied connection to the earth, a time of gratitude for the gifts of the earth, a time of fun and celebration for all ages. Stop by one of the many stations anytime between 5 and 7pm. 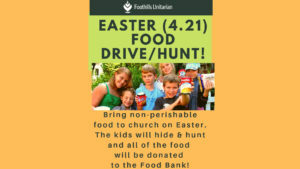 Featuring: dandelion-syrup making, seed bombs, an orator's stage, singing, snacks, and more... A time of shared ritual begins at 6:30pm. Connecting to Serve: Love is in the Details! Car wash for Foothills Gateway!